For the Drapeaux gris (Grey flags) exhibition at the CAPC, Walker covered a partition with hundreds of posters showing scanned reproductions of some of the stones that were used in the construction of the building. Multiplied and then horizontally or vertically stapled to the partition, they stood out in the real exhitibion space like a monumental sculpture. 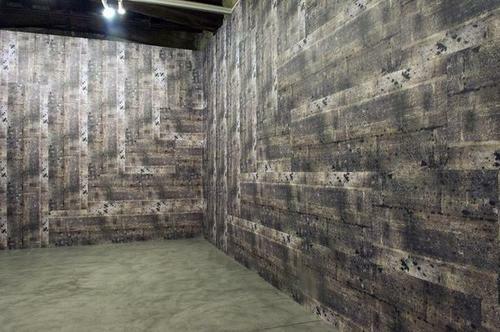 This simulated wall might be compared to the textures of video games (maps) or mobile phone skins, with their disturbing visions of other realities. This patchwork of images suggests a form of virtuality, and our willingness to be seduced by appearances The work was acquired from Paula Cooper Gallery, New York, in 2007. Kelley Walker, born in 1969 at Colombus, Ohio, belongs to a generation of artists for whom computers, digital photography and image-retouching software have led to a redefinition of techniques. Drawing enthusiastically on images published in the press, but producing his own pictures for certain projects, he orientates the interpretive process according to well-prepared codes of communication (with reframing, enlarging, multiplication, cross-hatching and superimposition). His intention is to reveal the extent to which the contemporary image, as a victim of excessive media exposure, has lost its informational potential : the dissemination of reproductions in all the currently-available media (magazines, television, advertising,web sites, mobile phones, etc.) has long since negated the narrative and cultural power of most images, retaining only their factual and sensational aspects. Taking this as his starting point, Walker exploits and brings to light the recursive specularisation of the contemporary image, paradoxically pointing out the precariousness of its status.